The under-fire striker has hit back at Manchester United’s recent critics. Rooney has scored two Premier League goals this season. MANCHESTER UNITED CAPTAIN Wayne Rooney declared on Thursday that he and his team-mates are “fighting” to save the job of embattled manager Louis van Gaal. British media reports claim Van Gaal is on the brink of the sack after a run of six games without victory and he stormed out of his weekly press conference on Wednesday after criticising the speculation about his job. But despite rumours of discord over his methods within the United dressing room, Rooney says that the players are firmly behind the manager. 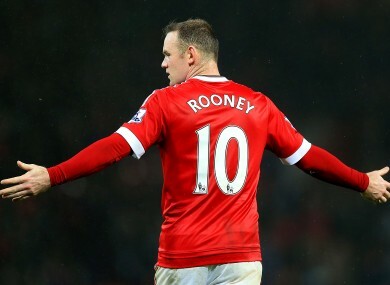 “We’re fighting for the manager and trying to get results to turn this around,” Rooney told Sky Sports. United slipped to fifth in the Premier League last weekend after losing 2-1 at home to promoted Norwich City — their third defeat in succession in all competitions. They visit Stoke City on Saturday before welcoming champions Chelsea to Old Trafford on December 28. Prior to cutting short his pre-game press conference, Van Gaal said the rumours about his future had affected his family and Rooney sympathised with the Dutchman’s complaint. “We all have families and sometimes things get written, which is not nice for your family to see,” said the 30-year-old England captain. It’s tough, but it’s part of football and part of being a footballer. It’s not nice when you’re getting criticism every week. Van Gaal has admitted that victory at Stoke on Boxing Day is now imperative. Asked if it was a must-win game, he told MUTV: “Yes, I think so, because when you have lost three times in a row, then you need a victory. We have focused ourselves to do that, but it is not easy. Stoke City have won against Manchester City, for example, and it’s a special ground. Email “Wayne Rooney: 'It's not nice when you're getting criticism every week'”. Feedback on “Wayne Rooney: 'It's not nice when you're getting criticism every week'”.